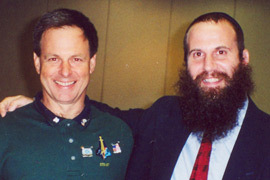 I first met Ilan Ramon at an almost clandestine gathering in my hometown of Satellite Beach, Florida. NASA personnel and Israeli Security teams had taken extra security precautions to ensure that nothing would go wrong. Even the location had been kept secret until the very day of the meeting. And that was how our friendship began. Ilan was a very special Jew. He often expressed the thought that he saw his trip to space as a mission. “I will represent the entire Jewish people,” he would say. As a representative of the Jewish people he wanted to do everything in the very best possible way Jewishly; including keeping Shabbat and eating only kosher food. “Kosher food?” the NASA staff shrugged their shoulders at the Jewish astronaut’s strange request. Ilan was not one to give up easily and a solution was found. NASA contacted My Own Meals, a company in Deerfield, Ill. that sells certified kosher food in "thermo-stabilized" sealed pouches for campers. Shabbat also presented quite a challenge. A day/night cycle in orbit is 90 minutes long, which means that a week lasts a mere ten and a half hours from start to finish! Would Ilan need to keep Shabbat every half day?! At his behest I brought his case before some of the world's leading rabbinic authorities, who ruled that he would keep the Shabbat times of his place of departure – Cape Canaveral. Ilan’s Jewish pride and his resolve to keep the Torah thousands of miles from earth, left a very strong impact on our community and on Jews all over the world. On Shabbat morning, I walked with my daughter to Shul. At 9:16 am, the estimated re-entry time, her eyes were fixed on her watch, waiting for the sonic boom signaling the shuttle's re-entry. But the skies were silent. We arrived to shul and the prayers began. Suddenly a friend from the local police station rushed in and told us that there had been an accident and everybody on board was killed. People began streaming to the Chabad house. Some placed flowers at the foot of the digital sign wishing the crew members a safe return. The Shabbat passed in a surreal blur of sorrow. A week later, on Friday morning at exactly 9:16 am – the time when they were supposed to have landed – a short but heart-wrenching ceremony was held and I was asked to share some thoughts. The atmosphere was thick with sadness. In the name of Ilan and his family, I thanked the staff of NASA for their efforts and tried my best to lift their spirits. “Ilan told me, 'Jerusalem we have a problem! '” I said. “He wanted to know how to keep Shabbat where there's a sunset every 90 minutes and a new 'week' every ten and half hours...” I told them about his supreme efforts to fulfill the mitzvot of his Creator while in orbit. “Ilan Ramon taught us a powerful message: No matter how fast we're going, no matter how important our work, we need to pause and think about why we're here on Earth." This, if you will, is the legacy of Ilan Ramon. Note: A voice-over of Rabbi Konikov's remarks was included in the NASA film "16 Minutes From Home" produced as a memorial for the Columbia crew (you can hear Rabbi Konikov's voice at 5:06 minutes). Rabbi Zvi Konikov and his wife are co-directors of Chabad of the Space & Treasure Coasts, Florida. Ilan Z May the Angels protect you and provide you with all their love. Toda Ilan for your dignity and Jewish heart.